Becker Windmills is a fantastic company that makes high quality, beautiful windmills. They offer a wide variety of aeration products to help people maintain healthy and beautiful ponds. 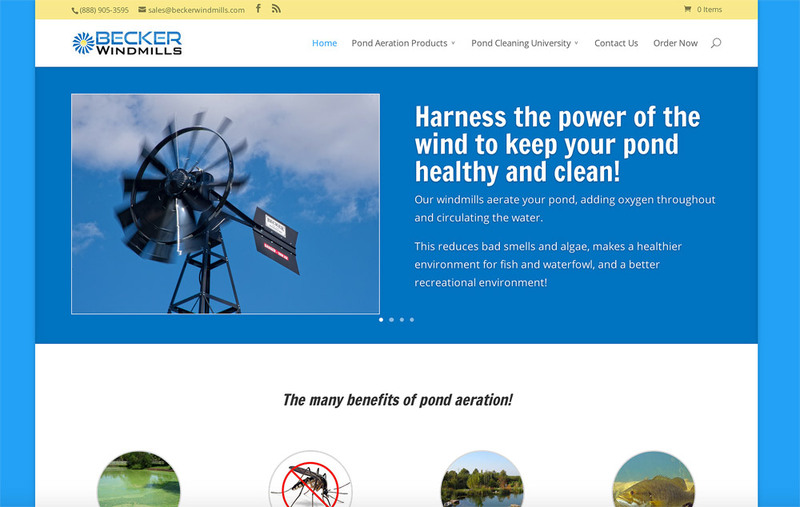 Webcore was tasked with creating a unified vision for Becker Windmills’ online presence. It was in conjunction with their sister company, MuckSuckers. Both companies work together to offer everything needed for both residential and commercial pond owners. A ton of research was involved up front to spell out to customers just what it takes to aerate and maintain a pond. At Webcore, we believe it all starts with content. Great content that is presented in an attractive way is what ultimately sells people on a product. Having a great design is nice, but it’s only part of the puzzle. And having a great design but little or no content (or crappy content) won’t lead a potential customer from entering your website to converting them to a sale. The result was a pretty, easy to navigate website that informs the user.